Founded largely on the concept of Karma, Buddhism espouses a belief in the cycle of suffering and rebirth in which good deeds and bad deeds produce seeds that are actualized in either the present life or through later rebirth. Buddhism teaches that life is suffering, suffering is caused by desires and wants, suffering ends when those desires and wants end, and reaching that state is achieved by following a lifestyle laid out by Buddha. Set in those beliefs, a Buddhist monk's life is one of simplicity and monastic dedication to the religion and its tenets. 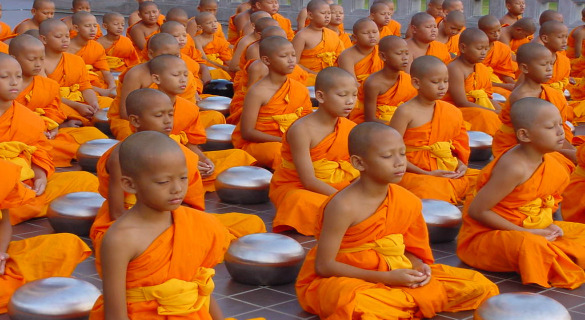 Monks must be at least 21 years old before agreeing to take a vow to follow the 36 rules of conduct for a novice monk. There are eventually 227 rules of conduct for male monks. The path to those 227 rules of conduct takes place along a journey of four steps. - Not take the life of a sentient being. - Not engage in sexual misconduct. - Refrain from false speech. - Refrain from becoming intoxicated. The second step involves entering a monastic way of life and living in a monastery. It is during this stage that monks begin wearing the familiar and traditional monk's robe. The robe is utilitarian and is made several pieces of fabric that are mended together. In keeping with a minimalist way of life, the robe's function is to simply protect the monk from the elements. During the third step, the monk is considered a novice and spends a set amount of time in preparation and familiarization while getting ready for the last step of their journey. In the fourth and final step of their journey, the monk takes a vow for the 227 rules of conduct and becomes a fully ordained monk. The Buddhist monk's life involves taking the vows for their lifetime. However, they are able to return to a secular life, thereby temporarily abandoning their vows. They are able to return to their vows up to seven times in their life. Because it is considered extremely negative to break a vow, this practice allows them to either keep their vows pure or leave the lifestyle for a short time. Along their journey, the ultimate goal of a Buddhist monk's life is to attain liberation from suffering through self-discipline and by following the path of Buddha.